31 And after the angel had departed, Laman and Lemuel again began to murmur, saying: How is it possible that the Lord will deliver Laban into our hands? Behold, he is a mighty man, and he can command fifty, yea, even he can slay fifty; then why not us? 1 And it came to pass that I spake unto my brethren, saying: Let us go up again unto Jerusalem, and let us be faithful in keeping the commandments of the Lord; for behold he is mightier than all the earth, then why not mightier than Laban and his fifty, yea, or even than his tens of thousands? 2 Therefore, let us go up; let us be strong like unto Moses; for he truly spake unto the waters of the Red Sea and they divided hither and thither, and our fathers came through, out of captivity, on dry ground, and the armies of Pharaoh did follow and were drowned in the waters of the Red Sea. 3 Now behold, ye know that this is true; and ye also know that an angel hath spoken unto you; wherefore can ye doubt? Let us go up; the Lord is able to deliver us, even as our fathers, and to destroy Laban, even as the Egyptians. Clearly Nephi intended to use this particular phrase in context of the exodus/deliverance motif. Accordingly, the focus upon the specific verbiage employed within his narrative is hardly a case of earth-shattering profundity considering the theme is also explicit; nonetheless, it does add a measure of insight into Nephi's emphasis upon the motif, and perhaps his use of this verbiage is intended to serve a dual purpose: 1) reference the direction that they need to go to Jerusalem, equating "up" with north; while, 2) simultaneously strengthening the power of his discourse by implicitly employing characteristic verbiage that emphasizes the exodus/deliverance motif that he discusses explicitly. This presumption, of course, takes for granted that Nephi intentionally used this specific language to emphasize the motif. Considering that the repetition of the phrase is a component within the context of his exodus/deliverance discourse seems to justify the assertion that this was deliberate on Nephi's part. One other point of possible implication, and possible third purpose for employing this specific verbiage, is the connection that this phrase has to Isaiah (and Micah) regarding the oft-repeated scripture relating to the temple: "And many people shall go and say, Come ye, and let us go up to the mountain of the LORD, to the house of the God of Jacob; and he will teach us of his ways, and we will walk in his paths: for out of Zion shall go forth the law, and the word of the LORD from Jerusalem" (Isaiah 2:3; Micah 4:2). This is one of the first scriptures from Isaiah's writings that Nephi copies on to his plates (2 Nephi 12:3). The emphasis on 'going up' was to visit the temple where the participant would be taught "his ways" so that they could walk in "his paths." The scripture emphasizes that the "law" would come from Zion, and the "word of the LORD" from Jerusalem. Both Jerusalem and Zion are mentioned in the context of "the mountain of the LORD," and the "house of the God of Jacob," which we presume to be equivalents. In other words, the law (tôrâh), and the Lord's mouthpiece (the prophet, priest, and king) would deliver the "word of the Lord" in order for the Israelite to know how to walk in "his paths." In our day we would simplify this as Latter-day Saints giving heed to the scriptures and the living prophets, while recognizing the temple as the pinnacle of this instruction. The torah has reference to the five books of Moses (Genesis through Deuteronomy). In addition to the living prophet, the "word of the Lord" could possibly have reference to the prophetic (nevi'im) writings. Jeremiah 1:4 reads that "the word of the Lord came unto me;" which is a phrase also repeated in Ezekiel 6:1, and Isaiah similarly declares the "word of the Lord" beginning in Isaiah 1:10. Nephi said that the brass plates contained the "five books of Moses," as well as "the prophecies of the holy prophets, from the beginning, even down to the commencement of the reign of Zedekiah; and also many prophecies which have been spoken by the mouth of Jeremiah" (1 Nephi 5:11-13).6 Thus, the persuasion to "go up" to get the plates may have had some reference to Isaiah 2:3 in obtaining the law from Zion and the words of the Lord from Jerusalem. Nephi had previously employed the admonition to "go up to the land of Jerusalem" (1 Nephi 3:9) for the purpose of obtaining the "words which have been spoken by the mouth of all the holy prophets" (1 Nephi 3:20). Building up to his exhortation he adds the request to "let us be faithful in keeping the commandments of the Lord" (1 Nephi 3:16). In his narrative, Nephi explains that it was "after this manner of language" that he persuaded his brethren to be faithful (1 Nephi 3:21), which speaks to his deliberateness in framing the exodus/deliverance motif, and the charge to go up to obtain the plates. Further, an angel repeats these same words to Laman and Lemuel: "Behold ye shall go up to Jerusalem again..." (1 Nephi 3:29). The missing component in this allusion is the temple. The brass plates weren't kept at the temple, rather, they were housed in the "treasury of Laban" (1 Nephi 4:20). For purposes of Nephi's literary allusion, however, the brass plates did contain the law and the word of the Lord, which they obtained from Zion / Jerusalem (Psalm 76:2). 1 S. Kent Brown, "The Exodus Pattern in the Book of Mormon," BYU Studies 30/3 (Summer 1990):111; reprinted and revised in S. Kent Brown, From Jerusalem to Zarahemla: Literary and Historical Studies of the Book of Mormon (Provo, UT: Brigham Young University Religious Studies Center, 1998), 75-98; refer to Brown's article for a small bibliography on this topic. 4 As part of the Exodus motif, 'deliverance' is Nephi's primary emphasis. Considering that he forged and engraved the small plates a number of years after this event occurred (2 Nephi 5:29-33), he was able to cast his narrative within a framework that encouraged interpretation through focusing upon his stated objective: "But behold, I, Nephi, will show unto you that the tender mercies of the Lord are over all those whom he hath chosen, because of their faith, to make them mighty even unto the power of deliverance" (1 Nephi 1:20). Nephi's usage of the phrase "tender mercies" seems to draw from the Psalms where this phrase is used ten times, and seems to have some correlation with the exodus/deliverance theme: Exodus 15:13, Psalm 25:6, 10; 79:8-9; 119:77. 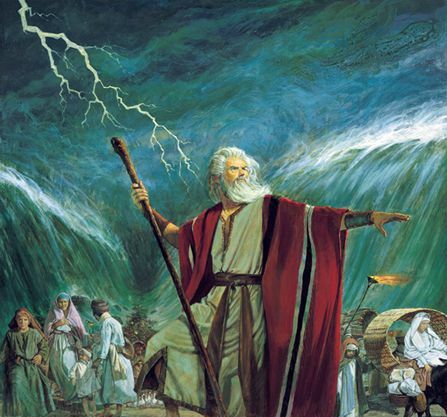 6 Biblical scholars generally believe that the torah, or the pentateuch, was completed in its final form around the 5th century BC, thus Nephi could not have had the "five books of Moses" that we have today. Leviticus, in particular (as well as large portions of Exodus and Numbers) were believed to have been written by a priestly school, traditionally assumed to have been exilic and post-exilic, which would render the "five books of Moses" as nonsensical, or even anachronistic. Much work has been done by scholars such as Menahem Haran, Richard Elliot Friedman, and others to redate the beginning of the priestly contributions of the torah to Hezekiah's day (roughly one hundred years before Lehi's departure). Similarly, the "Deuteronomic school" is believed to be responsible for Deuteronomy and other portions of the Bible (much of Joshua through 2 Kings). However, this "school" is presumed to have begun around Josiah's day (the generation before, and slightly overlapping, Lehi's day). It is well beyond the scope of this article to delve into this particular topic any further, but it is sufficient to acknowledge that the brass plates could very well have had the torah, although it would certainly have been different from the form of the torah as we have it today.